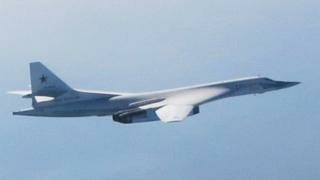 Fighter jets were scrambled from an RAF station in Scotland after Russian military aircraft flew close to UK airspace. The Typhoons later returned from over the North Sea to Lossiemouth. Defence Secretary Gavin Williamson said: "Our brave RAF pilots have shown again that we are ready to respond to any threat to the UK." He added: "Alongside our NATO allies, we must remain vigilant and aware of Russian military activity." Similar incidents have occurred in the past. The latest came as Nato forces began gathering Scotland for Exercise Joint Warrior. Warships, aircraft and thousands of personnel have arrived for the start of the UK-led military training on Saturday. Joint Warrior is held twice a year, in spring and autumn. The Clyde is the gathering point for many of the ships and some of the aircraft have arrived at RAF Lossiemouth in Moray. The exercise will involve live-firing training at ranges in the Highlands, including at Cape Wrath near Durness.